Situated far down in South Goa, about 70 Km from the capital city of Panjim lies the beautiful beach of Palolem. 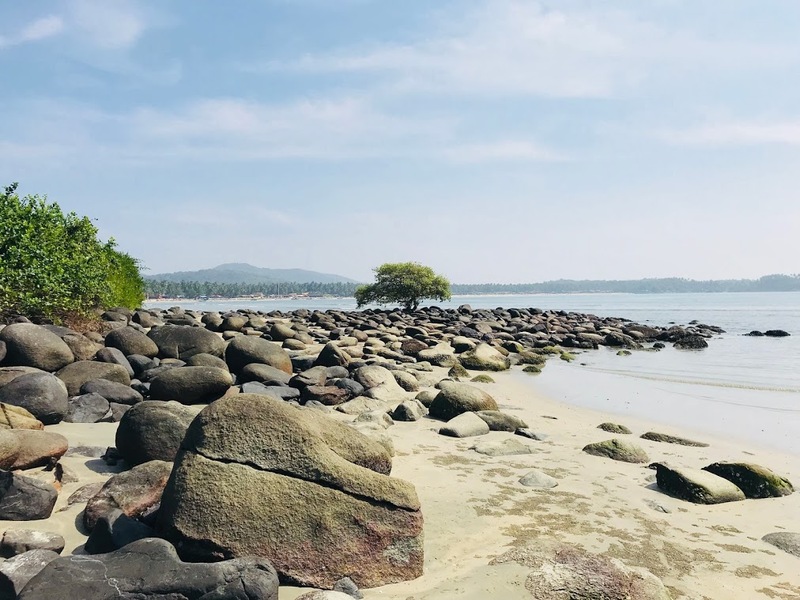 I had been so caught up in the allure of the neon lit swanky lounges and fancy beaches of North Goa that it took me quite long, almost a year, to think of visiting Palolem. I finally did and just fell in love with the place. Since then I have made multiple visits to Palolem and on every visit, we have managed to discover something new - a new beach shack, a new part of the beach we hadn't explored before, a new experience, or a new memory we made. 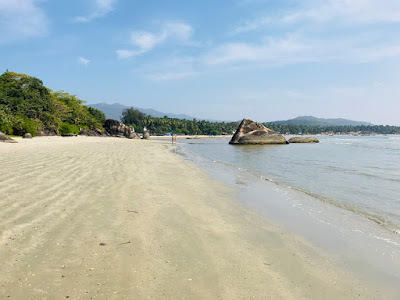 What makes Palolem beach special is its natural beauty - the charming landscape of palm trees, rocks, back waters, a forested island, the tree cover and the distant hills surrounding it; add to this, beach shacks, resorts, water sports and a plethora of delicious food options to choose from. While our previous trips were mostly spent beach bumming, this one turned out to be a little different. We had gone with a bunch of friends and little kayaks going around in the sea caught our attention. Before I could make up my mind about it, I was strapping up the life jacket. Though I do love beaches, let me confess that I'm quite chicken hearted when it comes to water sports; but its the other way round with my husband! So while our group jumped with excitement, I just got into the kayak, trusting my life jacket. There are very few experiences in life that thrill you and yet fill your mind with a sense of peace. Perfect moments that you wish would last forever. Memories that run to your rescue when you are feeling low. My kayak ride was one of those. 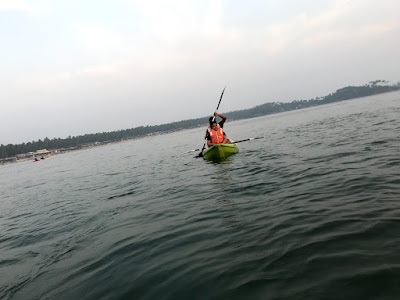 Palolem bay with its gentle waves let the kayak slowly drift away from the crowd and buzz of the beach, and a zen like feeling set in, with just the sound of the oars and waves crashing on the rocks at a distance. As the twilight slowly engulfed us, we just stopped mid way, savouring the beauty around us, as the hills and trees slowly began to fade and the moon made its appearance. It was just wow! I mean, what could be more romantic than this? So my courageous efforts did pay off! 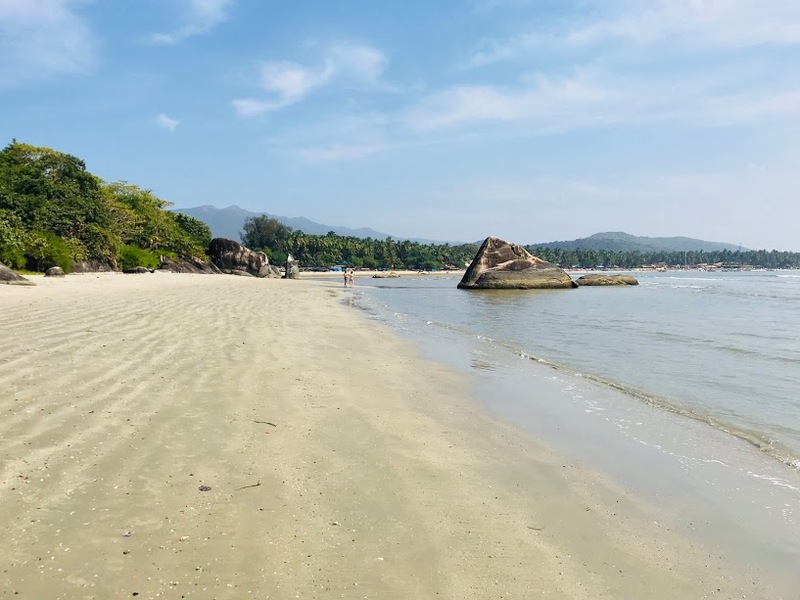 The long stretch of Palolem beach has something to offer for people of all ages and interests. If you love water-sports, the most preferred ones around here are kayaking, para-sailing, snorkeling and scuba diving. The flat beach with gentle waves makes this beach safe for swimming. 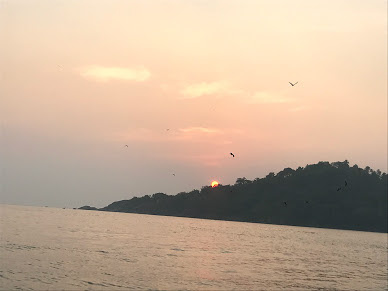 If you want to experience something new, get a boat ride to the monkey island or the butterfly beach farther up north to explore the untouched beauty of these places. The boat rides offer dolphin sightings too! If you want to stay away from water activities and just relax by the beach, there are perfect spots for you. walk away from the crowded areas of beach shacks towards the northern side, in the direction of the monkey island. You can see the backwaters here near the hill. This area is a little secluded and very quiet with fewer shacks and beach huts. If it is low tide, cross the backwater stream on foot like we did and you'll find a more secluded place with very few people. The water is quite shallow here so its great for swimming especially if you are a beginner. As you keep walking, the landscape gets so magical with beautiful rock formations and clear blue waters. A few steps more and there is this shack called 'Sundowner' facing the island and offering some amazing views around. Cancon island, popularly known as monkey island is a small island towards the north of Palolem beach. 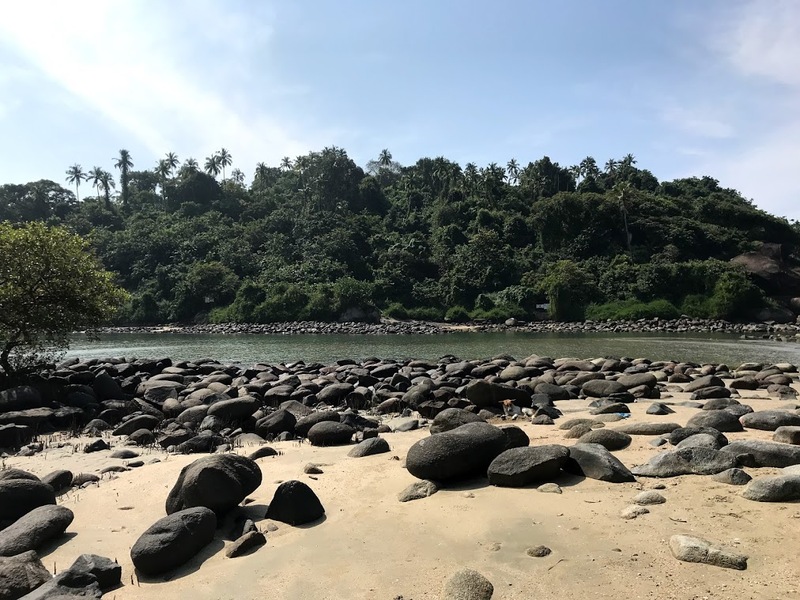 A wooded land that is home to a lot of monkeys, it is accessible by a short swim during low tide. We did go till the island in our kayaks but didn't venture inside as it was getting dark. The island along with the stretch of rocky strip around makes a very scenic spot. 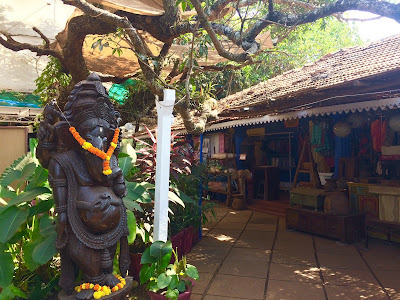 Though not too many, Palolem has some very good shacks and cafes offering delectable cuisine from around the world. Our favourites are Drupadi and Cafe Inn. Magic Italy is also a great place especially for their pizzas. For Indian cuisine, try the restaurant in Palolem beach resort. There are numerous other European and Goan eateries all over palolem. If you prefer to stay by the sea, go for one of the beach huts and cottages which range from budget to luxury accommodations. The Havana Cuba beach huts are quite popular but can be slightly expensive. There are a lot of very good beach resorts that offer world class amenities combined with breath-taking views of the sea. If you are budgeting, opt for some non-ac beach huts with basic amenities or choose from a number of guest houses in Palolem village. Hotels slightly away from the beach are usually less expensive so choose accordingly. Regarding the night life, there is the famous Silent Noise Club that hosts the legendary silent noise parties every Saturday. other than this there is not much of a party scene here but most of the shacks remain open until late night and there are a couple of ones like the Silver star shack that stay open all night. Cabs can be hired from anywhere in Goa or you can rent self drive vehicles. Speaking of Public transport, you get buses from all major towns and villages of Goa. The nearest railway station is the Canacona station about 2 KM from Palolem beach.